Napoletano, or Neapolitan, Horses originated on the plains between Naples and Caserta, in the Campania region of Italy, but may have been bred throughout the Kingdom of Naples. Neapolitan horses were frequently mentioned in literature from the 16th to the 19th century and noted for their quality. Corte wrote in 1562: ‘in Italy the horses of the Kingdom of Naples are greatly esteemed; [there] many fine coursers are born ... suitable for use in war and in the manège and for every service that the rider may require.’ The decline of the breed was noted in the early 20th century by Mascheroni (1903) and Fogliata (1908). Some sources state that by 1950, the original Neapolitan horse was deemed extinct, but its lines were incorporated into other breeds, most notably the Lipizzaner, however, a breed called the Napolitano exists in Italy today, and is recognized by the Italian government. 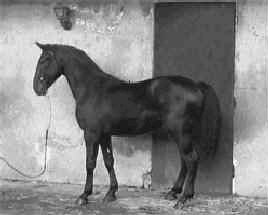 According to Gouraud, ‘a dedicated breeder is hoping to be able to rebuild the breed.’ La Repubblica reports that the attempt is based on a single stallion, Neapolitano ‘Il Vecchio’, which belonged as a foal to Marshal Tito and passed when old to a Serbian farmer, from whom it was purchased and imported to Italy in 1989. Napoletano horses are as they are known today is one of the fifteen indigenous horse ‘breeds of limited distribution’ currently recognized by the AIA, the Italian breeders' association, under the terms of Ministerial decree D.M. 24347 dated 5 November 2003; its status was listed in 2007 as critical by the Food and Agriculture Organization of the United Nations.In 2005, a total population of 20 mares and 4 stallions was registered.